Blending your own smoothies from the comfort of your home is becoming a huge trend in the health and fitness world! I recently just bought a smoothie blender and I use it almost every single day. Instead of going to a restaurant or shop to get a smoothie, you can make your own right at home with one of these great health shake blenders. The best part, is that your smoothie can be made healthy and help your path to weight loss or great nutritional health! It will also cost you a whole heck of a lot less in the long run. By having your own smoothie blender, you will be able to make delicious protein shakes, fruit smoothies, or even a smoothie that helps you get enough greens and veggies! The tough part is choosing one of the best smoothie blenders in 2018. There’s a ton of options! The opportunities are endless and the only limit is your imagination. In choosing the right blender, you’ll need to consider the different features available. Finding the right blender to fit your needs is going to be the goal. Here are the many things you’ll need to consider. Are you buying a blender in order to make one personal smoothie? Or, are you buying a blender to make smoothies for the whole family? A personal blender is a machine that uses an on-the-go cup instead of a giant traditional version. Personal blenders can be extremely convenient and are easy to clean! You won’t have to dirty multiple dishes when using this type of machine because you blend it, then drink it right out of the same container. Traditional blenders are much bigger and you’ll need to pour your smoothie into a cup to drink it. This is perfect for making multiple smoothies for a family, but it will take more work during clean up. Are you going to be crushing a lot of ice? Or, do you just need a blender to mix up juices and powders? This is going to help you decide how many Watts to look for when purchasing your blender. On average, most blenders are between 500-1000 Watts. However, if you’re looking to chop a lot of ice, you may want to consider looking for more power! The higher the Watts, the smoother your smoothies will be. It will also take less time to blend! Research the type of smoothies you’re interested in making and decide what type of controls you need. Do you need a pulsating mode? High Speed? Chopped mode? Most blenders that are made for smoothies even have a smoothie mode that will make sure you’re ready to go! If you use the smoothie mode on your blender, you know its going to come out perfectly smooth! Keep this in mind when deciding! Consider what size of blender you’re purchasing! When its not in use, you’re going to have to store it somewhere. Make sure you have enough storage space and counter top room in order to use your blender efficiently. There are many different sizes available. You will be able to find one that fits your kitchen perfectly! How difficult is the clean up with your device? I’ll be the first to say, if cleaning up after making your smoothie is difficult, I probably will not be making smoothies very often. Cleaning up after making a personal smoothie in the blender cup option is such an easy clean up! You can drink right out of the container you blend in and it avoids all the extra clean up work. I would never purchase anything else. If you don’t plan on using your blender very often, you may want to purchase a cheaper blender. However, if you think using your blender could become a part of your daily routine, absolutely go all out! If financially able, purchasing a higher quality blender with a powerful motor will make your life a lot easier than picking a cheaper option. Your drinks will be smoother and will blend in a lot quicker of time compared to a cheaper model. It will also most likely have a longer life and even have a better warranty option. This is something you’ll want to check into before purchase. Ninja has been one of the top companies in the blender market for 20 years. They have perfected and crafted incredible kitchen pieces including many different blender options. Ninja blenders have been known to be very high quality, long-lasting, and incredible devices. The Nutri Ninja Personal and Countertop Blender is one of the best blenders on the market. I personally use this blender just about every single day. It has so many different usage options that are perfect for single servings all the way to making smoothies for your entire family. One of the best features about this unit is the ability to use a large jug, or a personal cup. This is perfect because if you’re making smoothies for the whole family you can easily use a large jug to blend. However, if you are only making a personal smoothie and you’re on the go, you can just use the personal blender cup and drink out if without creating more dishes! Another great feature, is the amount of blending options you have with this model. With 1200 powerful Watts, you have 8 powerful blending options. This blender also uses Auto-iq Technology. This new smart option offers the perfect blend that is timed and does all the work for you. You will be extremely satisfied with this versatile machine. Cosori is a company that offers many types of kitchen equipment. They don’t specialize in blenders, but they do have some very solid options! This Blender option is special for a few reasons. First, it is in the low price range for blenders of its type and caliber. You will not be breaking the bank when choosing this blender. Compared to other brands, this is a cheap option that will surely meet your smoothie needs. It is a personalized blender that offers blender cups that you can drink right out of it. This is huge in saving time because you won’t have to clean up a giant container or pitcher. The downfall, is that it does not have the option to blend with a large pitcher or jug. So, this truly is a personal blender and is perfect if this is your intended use! At 800 watts, this is not the most powerful blender on the market, but it definitely can get the job done. For the price, you are getting 800 watts of power at a steal! This blender also features an auto blend program as to make your job a lot easier. It will do all the work for you. If you need a lot of blending options, this is not the blender for you. But, if you only need a pulse or unique blend feature, this is perfect. This unit is great for smoothies and can crush ice, seeds, or frozen ingredients such as frozen strawberries or bananas without a problem. You will also want to consider this option if you don’t have a lot of space in your kitchen. It is fairly small at the dimensions of 5.9 x 5.2 x 14.5 inches and 8 lbs. The Oster Versa Pro Series Blender is top of the line. This blender is a little more costly, but for the benefits, you may find it well worth your money. This blender is Amazon’s runner-up for best blender while considering cost. For the price, you sure get a lot out of this device. This unit has a 1400 watt motor that effortlessly slices through just about anything you need while cooking in the kitchen. For example, this blender can easily devour soups, nuts, crackers, chips, yogurts, veggies, fruits, and so much more! That is what makes this unit so special. It is versatile enough to not only be used for smoothies, but for all your healthy cooking needs. You will not need an ice chopper, food processor, or a handheld mixer because it can all be done with the Oster Versa Pro Series Blender. When you choose Oster, you’ll receive 3 programmed settings and a pulse option. You can choose smoothie, soup, or dips/spreads. 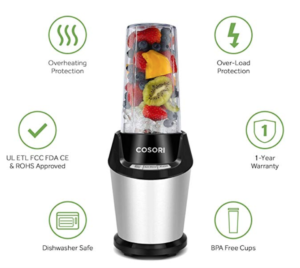 You will be able to most out of your smoothie blender when you choose this unit. It also fits in most cabinets with the dimensions of 9.3 x 10.3 x 17.6 inches and about 12 lbs. Have you heard of the Magic Bullet NutriBullet Rx yet? If you haven’t, let us fill you in. This device is very well-known and even has over 1,000 reviews on amazon. I’ve seen it on Television, the internet, everywhere. Why is there so much hype around the NutriBullet Rx? Well, for starters, it has a 1700 watt motor. This is NutriBullet’s largest and most powerful blender on the market. You will experience an incredibly silky smooth drink when you choose the Magic Bullet. With this strong of a motor, you’ll be able to conquer just about any type of smoothie or shake drink that you could ever desire! It even has a heating cycle for hot soups making this quite the smart product. If you’re looking for a beautifully blended soups, give this feature a try! This is truly a utility player. You can do anything with this unit! This blender can be both for individuals and for families. The Ninja personal blender is a simple yet precisely designed machine. Again, Ninja is one of the top brands in the blender market today. When you choose Ninja, you know you’ll have a positive and trustworthy experience. Earlier, we reviewed a unique and powerful Ninja device. The Ninja Personal Blender, is unique in its own way. This unit is for those who don’t need a lot of added features. Plain and simple, you want a cup, a blender, and a smoothie! You don’t need an expensive high tech and powerful machine. You are content with a reliable machine that offers you 700- Watts of ice crushing delight! The Ninja Personal Blender is on the lower priced end of the blender world. It won’t cost you a fortune, but it also doesn’t have a ton of features. Again, this is a simple machine but that is exactly what some of you are looking for. If all you need is something that can get the job done. You’re sold. Take the deal and run! Created in 1971, Cuisinart offers many types of kitchen appliances. One of their most prominent appliances, is their selection of blenders. If you’re really on a budget, the Cuisinart CPB-300 is a solid option for you. This blender is quite inexpensive, but there is a kicker. It lacks quite a bit in power. Let’s take a look at the different features you’ll receive with this unit. This blender has a 350 watt motor, yet is powerful enough to cut through ice. For most people, this amount of power will do just fine in making a delicious smoothie! It offers three different blending options including high, low, and pulse control. This blender comes with a BPA free 32 oz cup, a blender jar, a chopping cup, and four 16 oz travel cups. That’s right, you’ll receive many different cups when you choose this machine. If your goal is to quickly make a smoothie that you can take with you, wherever you go, this will help! You will only be able to make individual serving sized smoothies. There is no option for a large pitcher for an entire family. Although this is a cheaper option, it is surely durable and even comes with a limited 3-year warranty in case something goes wrong. This is another simple option for those looking to make smoothies on a budget. If you’re looking for a smart high-tech blender, this option is going to be for you! While living in the technology age, why not use it to our advantage right?! The NutriBullet Balance is a Bluetooth enabled device so you can connect your smart phone with the NutriBullet Balance app. You can get the app right in the Apple App Store or Google Play. This is one of the most high tech home gadgets out there. With the use of the NutriBullet Balance app you will be able to calculate the exact nutritional value of your smoothie as you add your ingredients! That’s not the only purpose of this app. You can also customize your experience to the max by tracking your own wellness goals, dietary restrictions, and eating styles. If that isn’t enough, your app will help you keep track of your pantry and foods you need to purchase. Wow. This truly is a smart device. Let’s talk about what else you get when you purchase this unit. Another huge benefit, is the smart sensor scale. When making health smoothies, you will need to weigh out your ingredients so you know just what you’re going to put into your body. The smart sensor scale is very precise and accurate. You cannot go wrong here. This blender sounds INCREDIBLE. But it just keeps getting better. The NutriBullet Balance has a powerful 1200 Watt motor to ensure smoothie perfection. Let me show you a blender that’s a little more unique. The Braun MQ725 is a hand held blender instead of a whole blender unit. Let me tell you the advantages of using a hand blender instead of a regular blender. By using a hand blender, you can mix in any cup that you would like! If you have a favorite cup or bottle that you love to use, you can mix up your smoothie right in that bottle and take it with you wherever you go. A hand blender also takes up very little space. You won’t need to clear out your cabinets to find storage for a device like this. All you need is space in a drawer. Many people that purchase this hand blender, do so because it saves so much space. It’s very quick and precise in blending ice, fruits, veggies, sauces, dips, etc. You don’t have to set aside the time to use a full out blender. Clean up is another great reason to choose a hand blender. There are no small spaces and hard to reach cracks you’ll have to clean. You can easily wash the end of this device. In order to use this unit, all you need to do is hold the soft cushioned end, and press the button. The harder you press, the more power you’ll have. It is completely controlled by hand pressure! This is a perfect device if you’re looking for something small that’ll help you make a quick smoothie. This is another exquisite machine from Cuisinart. Again, Cuisinart is a great company that offers many different kitchen appliances. Specifically, they do great in the blender market. The Cuisinart CBT-2000 is an incredible machine built for commercial use and high power. You can choose two different sized machines to fit your needs. This blender is perfect if you typically make smoothies for a group of folks, like your family. It is one of the most powerful blenders on the market and with its variable speed control dial, you can boost your machine all the way up to 30,000 RPM. This is incredible speed and will crush whatever foods or ice you put in it. It also has a memory function perfect for setting preset blending times. You can change this at anytime, but if you frequently blend a smoothie for X amount of time, you can preset your machine to blend for that amount of time. It also comes with a 10-year limited motor warranty and a limited 3-year blender warranty. This machine is built to be high grade quality and shouldn’t have issues, but if you do, you’ll be backed with your warranty. The Hamilton Beach Wave Crusher is a great blender option as it comes with many different accessories. With this unit you receive a 20 oz. travel jar with a leak-proof lid. This is a very quality accessory and if you’re making personal smoothies, you will want to use this travel cup every single time. You can take it anywhere without worry of leak or spill. If you want to make a larger batch of smoothie, you can use the 40oz glass jar. You have so many options with this unit. You will be able to powerfully shred through ice with the 700 watt motor with ease. And, for the price, you’re getting a steal here. What Option is Best For You? Any of these ten options are great health shake blenders. What you need to consider, is how you will want to use your blender. If you are using it for personal use, you may want to choose a hand held blender or an on the go smoothie blender. This way, you only have a small cup to blend in and you can drink right out of it. If you’re cooking for the family, you may want to choose an option with a large blending jug. Either way, I am sure you will be happy with the selections of the best smoothie blenders in 2018. If you use one of these blenders or purchase one, comment and let me know how you like it! Hello, great post, I love smoothies, my wife and I made a 30 day detox once and we needed to drink one smoothie every morning, by that time we had the nutribullet, which is a very good blender. But the time came to move forward and we have now a Ninja with a big and a personal cup. We love it. But I really didn't knew of so many options. Especially of the cosori and the Oster. Thanks for this great post! This post helped me majorly. After going through everything I decided that the Oster Versa Pro was perfect for what I needed! Thanks for such an informative article. There are so many great blender options out there! I personally have a Vitamix blender, and it's the BEST. However, I had to give an arm and a leg to pay for it. It was worth it. Who needs that extra arm anyway? :) The downside is that if you want to make a personal smoothie, it's not the best for that. I have used the Ninja Personal Blender and I think that works great for a personal-sized smoothie. I have also used the big Ninja Countertop Blender, and that's great too. It doesn't blend as smoothly as the Vitamix, but it's good for the price. It's the one I recommend to anyone who want to keep all their arms and legs and not spend them on a Vitamix. Thanks for all these options! What a great list! I personally love my ninja, I have the same one that you listed up top and couldn't be happier with it! It's a little noisy, but it does the job so well I don't mind. Plus the capacity is phenomenal for when I'm making smoothies for a large group of people. I feel like it's a great blender for the price point!